The Watford striker is delighted after his goal sent the Hornets to the semi-finals of the FA Cup. Cometh the hour, cometh the man. With 15 minutes still to play between Watford and Crystal Palace in the Emirates FA Cup quarter-final, the former having been pegged back by an equaliser just minutes earlier, head coach Javi Gracia felt his side were in need of a change — and who better to entrust with a goalscoring duty than a striker constructing quite the reputation for striking from the bench? In recent weeks, Andre Gray has found starts limited for Watford due to the form of Troy Deeney and Gerard Deulofeu. However, his impact has hardly been diminished. In fact, if anything, it's been heightened. The 27-year old began proceedings on the bench against Everton and Leicester City but, sure enough, he was the man that singlehandedly earned Watford victory over both. With Palace frustrating their hosts at Vicarage Road and a semi-final at Wembley Stadium up for grabs, Gray was once again tasked with tipping the balance in his side's favour, a challenge he met relentlessly and, ultimately, fulfilled. His 79th-minute winner proved to be the difference between Watford and Palace in a tensely balanced encounter, and Gray feels it was the most significant of the numerous crucial goals he's scored for the Hornets of late. "They've all been winners, and important ones as well," he said. "Obviously this one's that little bit more special, getting us to Wembley. It's a great feeling overall." Any player is prone to frustration when, despite their best efforts, they can't merit consistent starts for their club. Gray's recent scoring tally indicates he is a player of considerable value to Watford, and perhaps one that should be featuring for the entirety of matches rather than feeding from limited minutes from the bench. It also shows that said frustration will not jeopardise his performances which are beginning to prove all the more crucial for the Hornets. The winning goal was one of good quality. Roberto Pereyra collected the ball in the middle third and drove forward before taking a heavy touch to the left, causing centre-back James Tomkins to track the Argentine to thwart the immediate threat to goal. Gray made a darting run between Luka Milivojević and Martin Kelly and, in the blink of an eye, a lofted ball from Pereyra met the striker's swinging left boot, with Palace goalkeeper Vicente Guaita helpless. "I've just got to keep making those runs. I didn't think Maxi [Pereyra] was going to play it, I didn't think he'd seen it, but it was a fantastic ball. It got caught in the wind a bit so I sliced it, but it probably worked out better because I think if I'd hit it cleanly it wouldn't have gone in. "It was a case of trying to get some energy back in the team and getting a chance and, again, I managed to put it away." Those in yellow and black were perceptibly downbeat after Michy Batshuayi's 62nd-minute equaliser following a sloppy mistake from Hornets veteran Adrian Mariappa, and reinstalling energy into those players was crucial. 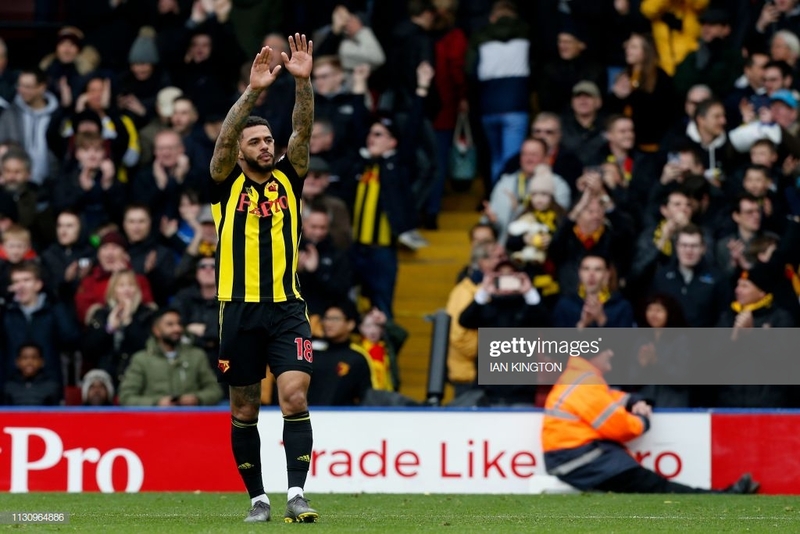 However, there were some 21,000 spectators at Vicarage Road that never lost their vibrancy and vigour, and Gray believes they were vital as Watford edged across the line to secure victory. "It was similar to the Everton game where there was a bit of bite in it, a bit of rivalry with the Palace fans, and you could see that. Throughout the game with the atmosphere and and then at the end as well when all the fans stayed to clap us off: it shows how much this means to them." Gray's rise to the summit of English football has not been as simple as that of many of the stars that currently feature in the Premier League. He began his career on the books of Shrewsbury Town, earning sporadic appearances through loan spells at lower league clubs, before firing Watford's rivals, Luton Town, to the Conference title in 2014. After that, impressive stints with Brentford and Burnley merited a £18m move to the Hornets in the summer of 2017. He struggled to hit the ground running in Hertfordshire, but Gracia appears to have rekindled the striker's qualities, and the fee paid for the 27-year old is looking more justifiable by the day. His journey is one of hard work and dedication, and treading such a path makes Gray all the more conscious of what it means to play at Wembley, the home of the English game. "It's massive. Obviously we played there against Tottenham [Hotspur] but it wasn't the same. I played the playoff semi-final there as well but that was in non-league. To do it in the FA Cup is huge. It'll be a great day, especially if we get to the final. "To be honest, I think it's a shame it's at Wembley, both the semi-final and the final; I think it takes a bit of the gloss out of it. But at the end of the day a day out to Wembley is going to be fantastic." The Hornets are on course for their strongest domestic season in recent memory. With dreams of European qualification still intact and now a semi-final to look forward to — the club's second in four years — success has arguably been achieved already. Yet Gray insists work will resume as normal as soon as those selected for international duty return from their service. "We've got a nice rest now with the international break. We've been on a good run so it's a good time to have this break and reenergise and refocus, come back the week after next and get cracking for the next part of the season."